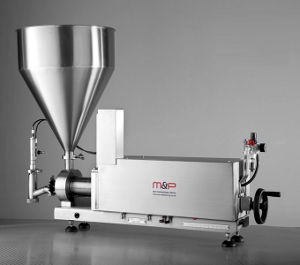 M&P Engineering Ltd offers a complete range of Food Depositors and Food Filling Equipment to suit many applications, such as filling free flowing products, paints, powders, solids, and jams. A complete range of supporting attachments and accessories is also available including; adjustable stands, product hoppers and a range of nozzles to suit various applications. M&P Engineering has expert knowledge of filler design within the company, we can also offer design and development of nozzles and systems to suit our customers individual requirements. All of our food processing machinery is supported by our spares and service department. This well engineered depositor has been designed with functionality and reliability in mind. Utilising extensive feedback from our customers and current operators of depositors, we have developed a robust, competitive machine, capable of filling almost any slurry liquid product. 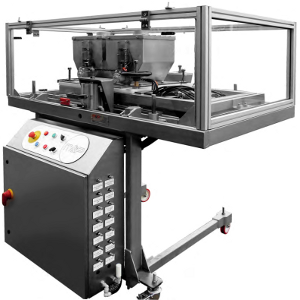 Our Multi Head Depositor has been designed to fill trays of different sizes with the same product. It is able to fill 6, 9 or 12 containers by simple adjustments. M&P’s depositors are really flexible, capable of filling a variety of products into a range of container sizes. Manufacturers and contract packers can rest assured they are investing in future-proof equipment. M&P Engineering has a long history of designing multi head depositors for specialist filling applications. The volumetric pocket filler is designed to handle a wide range of free flowing products, providing a lower cost option to weigh filling. The machine has a wide range of models and options, the machine shown here has twin hoppers and a two stage fill sequence available to allow half and half filling, for example nuts and raisins or popcorn and crackers. 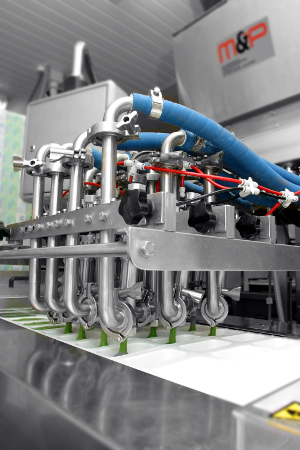 The machine was fully integrated into a production line, communicating with a product elevator and the tray forming machine.